Broad City’s Ilana Glazer: Why I Canceled My Event at a NY Synagogue After Anti-Semitic Vandalism | Democracy Now! comedian, writer and actress. She is the co-creator and star of the hit Comedy Central show Broad City. 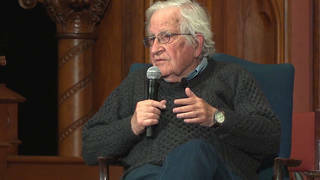 AMY GOODMAN: This is Democracy Now!, democracynow.org, The War and Peace Report. I’m Amy Goodman. We end today’s show here in New York City, where a political event hosted by Ilana Glazer of Comedy Central’s Broad City at the Union Temple Synagogue in Prospect Heights, Brooklyn, was canceled Thursday night after anti-Semitic and racist messages were found scrawled across walls throughout the building, just before the event was to begin. Among the messages were “Jew Better Be Ready,” “Insert Oven Here.” Another said, as we walk through the halls, “End is now,” “Hitler,” another scrawled “Free Smoke for [N-word] Jews”—and “N-word” was written out. And then there was one that said ”FPEE PR,” with what looked like a Puerto Rican flag. The graffiti comes amidst a surge in anti-Semitic hate crimes nationwide, including Saturday’s massacre of 11 Jewish worshipers at the Tree of Life synagogue in Pittsburgh. I was scheduled to speak at Ilana Glazer’s event last night to talk about coverage of the midterm elections and the coverage of grassroots movements leading up to it. On Thursday night, Ilana Glazer, after careful consideration, after looking at the graffiti, announced to the crowd of hundreds of people that she was canceling the event. ILANA GLAZER: Thank you for coming tonight. We have a situation that we will—that’s not presenting any immediate danger, but there were hateful, anti-Semitic [bleep] scrawled all over the space today, very recently, within the past couple hours. So we don’t feel safe. AMY GOODMAN: The Union Temple Synagogue in Brooklyn hosts outside events frequently, including an upcoming event next week commemorating the anniversary of Kristallnacht—that’s the Night of Broken Glass, November 10th, 1938, when the glass of Jewish stores was smashed throughout Germany. Well, for more, we’re joined here in our New York studio by Ilana Glazer, co-creator and star of the hit Comedy Central show Broad City. Welcome to Democracy Now!, Ilana. ILANA GLAZER: Hi, Amy. Thanks for having me. AMY GOODMAN: Well, it wasn’t just a few hours ago that we were together last night at the synagogue. You were just about to hold this event, which you were really excited about, but then you got word what was scrawled through the stairwells and halls of the synagogue. ILANA GLAZER: Yes. So, these Generator events, it’s—Generator is an online movement to encourage people to use their Instagram to talk about how policy affects their everyday lives, and humanize policy. And in these live events, I’ve been interviewing politicians and activists to sort of hear and compare about how they serve—how they both work for the people. And this week started with—it started and ended with white supremacy kind of ruining our programming. Last night was very—it was hard to tell. And every time we started talking about like what it could be, it just was like, no, we can’t—I can’t put these 200 people, who came to listen in a safe space—I can’t put them in that danger. ILANA GLAZER: Mm-hmm, yeah. And what was scary was that it was all over the building. And then the cops were kind of searching the building. It was too freaky. It was too freaky to hold it. AMY GOODMAN: And there are number of events in the building. And very interestingly, as we went outside, hundreds of really disappointed people, who were really galvanized for the midterm elections, I saw a sign outside, which we’ll talk about in a second, that has to do with an event dealing with what happened back in 1939. But talk about, when you talk about The Generator Series, what you mean. ILANA GLAZER: So, The Generator Series is an in-person gathering of people who are part of this online community, who are willing to share part of their platform—because all of us have a platform now—with—you know, to discuss how policy affects—how the government affects our everyday lives. It feels so amorphous or philosophical, until we hear about it, you know, affecting people’s bodies—women’s bodies, brown bodies, black bodies. And, you know, I think that we talk a lot in Generator about like not discussing politics, growing up in the '90s. “Don't talk about politics” was like a phrase on the tip of everyone’s tongue. And I think that’s what’s gotten us here today, with this divisive country and this divisive political landscape and this sort of representation of a president, you know, but not—it’s not really someone who has come up and understands policy and understands history or law. So, it was interesting last night that it’s like, you know, rather than sharing your story, we lived through a story. We lived through—we lived through a safe, you know, physically benign version of a white supremacist act. And yeah, I had four events scheduled this week. And in the first event, this candidate had to pull out, because I called his opponent a white supremacist on Instagram. He had to pull out. And I totally understood, and I had this like ideological crossroads, like “Did I do the wrong thing?” But this is—that was my view. And that silenced this candidate, Perry Gershon, from coming. And last night, I was like so ready. I have these beautiful, bright people ready to go, ready to canvass, ready to do—you know, I intended to point people in the community to canvass, to knock on doors and change the local elections, to win for—to help progressive candidates who stand for human rights politics to win. AMY GOODMAN: In New York and Long Island. ILANA GLAZER: That’s right. And I’m from Long Island, so it just has been like personal. And I’ve been in New York for—the city, for 13 years, so I just was very excited to point people in the right direction. And we saw—as a community, the Generator community, we saw how white supremacy silences those politics and halts that action. AMY GOODMAN: You know, people might be surprised to hear you talking so seriously, who are big fans of yours for Broad City. AMY GOODMAN: And, of course, you’re a stand-up comic. AMY GOODMAN: But, of course, last night there was not much humor. ILANA GLAZER: No. I mean, that was scary. That was actually just straight-up scary. And, you know, with the mass shooting last week, it was like already eerie to be having these events in a synagogue. But, you know, our president’s words and our politicians’ words, who stand for white supremacy, who stand for violence and aggression, like these words turn into action so quickly. We’re seeing that happen now. And especially with no commonsense gun laws, you know, that action can be serious very quickly. And we weren’t going to—we weren’t going to take that risk. AMY GOODMAN: You refer a lot to your Jewish identity on Broad City. AMY GOODMAN: As we just have a minute to go, your final thoughts on what this all means? And again, there were other slur words, too, like the N-word. ILANA GLAZER: Yeah. You know, I do—my Jewish identity means a lot to me. And I implore other Jews to align themselves with those who are also othered in this country. You know, this country was built on the backs of black and brown bodies. And Jews are in this weird middle space, but we are all othered. But we are all—as a unit, we are strong and can stand up and make change in these midterm elections. I’m just so—I hope that we do. I really hope that we do. Our voices matter. And we have to be a little more strategic about our safety, but we can make change, very imminently. AMY GOODMAN: Ilana Glazer, I want to thank you so much for being with us. Ilana Glazer, comedian, writer, actress, co-creator, star of the hit Comedy Central show Broad City. You can go to our website to see the images, at democracynow.org. A very fond farewell to our dear producer Laura Gottesdiener. I have no words. Thank you so much for all of your contributions here over these years.